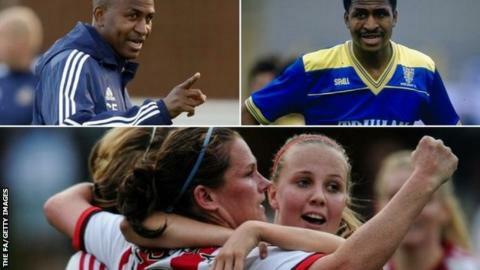 He was a member of the Wimbledon 'Crazy Gang' and now Carlton Fairweather hopes some of their old spirit can help Sunderland Ladies to success in the Women's FA Cup. On Sunday the Lady Black Cats travel to face Arsenal, English women's football's most decorated side, in the semi-final. A win will book their place in the final at Wembley on 14 May - exactly 28 years after Wimbledon upset league champions Liverpool at the same venue to lift the FA Cup. Midfielder Fairweather was the "level-headed one" in the Dons' squad - which included future Hollywood actor Vinnie Jones and uncompromising striker John Fashanu - although a broken leg prevented him from playing in the 1988 final. The 54-year-old has plenty of stories to tell from that era - throwing punches at one another in the centre circle being among them - but it is their camaraderie, spirit and determination to upset the odds which Fairweather has tried to carry with him into management. "They are less insane, that is definitely true," said Fairweather of his Sunderland side. "I'm not a great storyteller, but I will point the players in the direction of what we used to do. "It is definitely about the mentality - we were the underdogs, we had to work harder than everybody else and if we did that and stuck together, then hopefully we would surprise a few people." "In WSL 1 you have to remember that we are playing against some good sides, full of international players. We are not in that position yet - we have two internationals and a few on the fringes, so we have to try to do things outside the box and work a bit harder." So is blaring music on a Boombox while walking into away grounds and burning team-mates' clothes - Wimbledon-style - part of that "outside the box" thinking? "Everyone is safe in regards to that," Fairweather laughs. A generation and gender separate Fairweather's Wimbledon and Sunderland, but their efforts in breaking the established order of English football are similar. Wimbledon rose from non-league football to eventually win promotion to the old First Division in 1986. They were tipped to go straight back down, but after five games they were top of the league. Sunderland Ladies were the first team to win promotion from WSL 2 in 2014. They were also tipped to go straight down, but topped the league midway through the 2015 campaign. Since eventually finishing fourth last season, above two-time WSL champions Liverpool and 2014-15 Champions League quarter-finalists Bristol, Sunderland have strengthened by doubling the number of players on full-time contracts to 12. "If we want to compete like last year we needed everybody to be together, we need everyone to improve individually as well as collectively," Fairweather added. "That is how we got to where we were and it will be the same again this year, teams will now know what we are about. There might need to be a different strategy in how we do some things, but the principles will always remain the same. "Having 12 full-time players makes a difference. We are playing teams of completely professional players and that is where we have to think differently to other sides." Beth Mead was the embodiment of Sunderland's WSL 1 success last season, finishing as the league's leading goalscorer in her first top-flight campaign. Before that, she helped fire the Lady Black Cats to the top division as WSL 2 champions with 10 goals in 15 league games. In 2012, she was also their top scorer as they completed a Women's Premier League and League Cup double. Mead talks of Sunderland's rise to the WSL 1 ranks with pride, having twice had bids for a top-flight licence denied - first when the WSL was launched in 2011 and again when it was expanded to include WSL 2. Despite Sunderland winning the old Premier League for three straight seasons, Manchester City were admitted to England's top-tier competition in 2014. "We haven't had it all smooth, we got rejected in our bid for WSL and we worked that little bit harder than other clubs who have been gifted it," Mead said. "I think we have a lot more grit and determination up in the north east." There are echoes of Wimbledon's approach in the way Mead speaks. "The girls here have a lot of character and that is the difference between us, as opposed to those teams that can bring the big stars in. We have a group of girls that are like family, we are a close-knit team," she added. "We are hard to break down because of just how close to we are and how hard we work for each other." As for Fairweather's influence as manager, it comes from his philosophy on the game and not the unconventional approach from decades past. "He tells us a few of his stories, but he has told us not to repeat them, so I won't stitch him up," said Mead. "He just tells us to be who we are - don't change. And it is working for us."